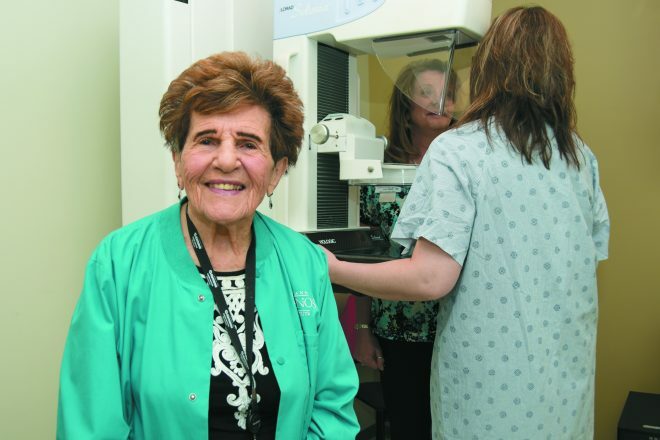 Fay Jacobs, a 93-year-old volunteer at Karmanos Cancer Institute’s Weisberg Cancer Treatment Center, helps women prepare for their mammograms at the Farmington Hills-based center. Also pictured is Lisa Abele, lead mammographer at Weisberg, and a patient. Fay Jacobs, 93, of Farmington Hills, isn’t someone who spends her days shopping and going out to lunch. 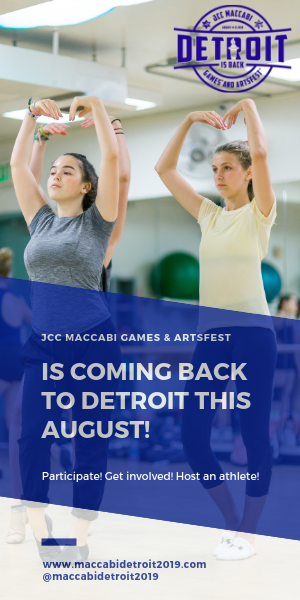 Rather, you’ll find her exercising at the Costick Activities Center, meeting friends from Congregation Beth Shalom in Oak Park or volunteering at the Barbara Ann Karmanos Cancer Institute’s Weisberg Cancer Treatment Center in Farmington Hills. With her warm touch and friendly smile, Fay serves as a patient navigator at Karmanos, helping women prepare for their mammograms, and serves in a secretarial capacity. She volunteers at Karmanos on Wednesdays for half a day. Fay has been a volunteer at Karmanos for 10 years. For her decade of volunteerism to Karmanos, Fay has been honored by the Farmington Area Commission on Aging with the Margaret Loridas Diamond Award. 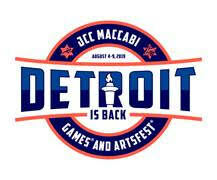 She, along with four other winners, were celebrated recently at a ceremony at the Costick Center in Farmington Hills. To be considered for the diamond award, an individual must live in the Farmington/Farmington Hills area, must be 75 years old “or better” and must be a current, active volunteer. The commission also gave out a “gold” level award, a S.A.G.E. Award for a volunteer in the community schools and awards for two individuals who volunteer at Costick. “Fay is my hero,” said Kathleen Hardy, LMSW, oncology social worker at Karmanos who nominated Fay for the award. “If I could be like Fay, I would welcome living into my 90s. She is cheerful, full of energy and always has such nice things to say to everyone. Elizabeth Katz is the former external marketing and communications manager at the Barbara Ann Karmanos Cancer Institute.